Embracing a global perspective of art and expertly explaining the development of art across time and cultures, this comprehensive and authoritative five-volume set presents the entire history of world art. Using broadly defined subjects, this richly illustrated reference is organized chronologically into insightful chapters, each dealing with the art of a specific period, geographic region, or civilization. Covering all of the recognized major arts, including architecture, painting, drawing, and sculpture, as well as other art forms such as ceramics and metalwork, Facts On File Encyclopedia of Art shows readers the diversity of expression in the visual arts. Fundamental characteristics of the major styles and periods of art history are clearly expressed, and their significance is analyzed. Chapters detail significant aspects of the subjects in digestible sections, covering the arts of a specific people or dynasty, art made of particular substances, or art used for special purposes. Bringing together the vast accumulated knowledge of many scholars, the encyclopedia provides the information necessary for readers to comprehend the significance of various forms of art and to appreciate the wide-ranging artistic achievements of numerous cultures throughout history. The sections on Modern American Art, European Art Since World War II, and various others detailing non-Western art cover such topics as feminist art and women artists; graffiti art; video art, sound art, and installation art; and pluralism in art at the beginning of the 21st century. 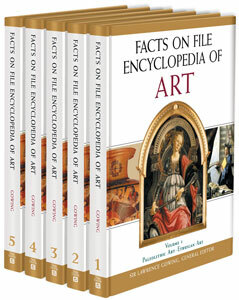 In addition to the clearly written text and beautiful full-color reproductions of artworks, Facts On File Encyclopedia of Art contains many special features intended to highlight major topics, spur readers to further research, and ensure easy access to information. Maps show readers the locations where civilizations and peoples created their works of art, text boxes offer detailed explanations of selected topics, and a bibliography follows each section. Volume 5: Realism to South African Art. For each volume: Full-color and black-and-white photographs and illustrations. Maps. Index. Bibliographies. In five volumes. General editor Sir Lawrence Gowing was a distinguished painter, author, and the Slade Professor of Fine Art at University College, London. He had many successful one-man exhibitions and his work is represented in major collections throughout the world. His numerous publications include studies of Renoir, Vermeer, Cézanne, Constable, Goya, Turner, Matisse, and Hogarth, as well as a highly praised biography of Lucian Freud. "...a thoughtful study of the visual arts from the Paleolithic Age to the contemporary art world...Roughly half of the illustrations are in full color, and the reproductions are generally excellent...the text is extremely well written and impressive in its breadth of discussion...highly recommended for all college and public libraries." "Black-and-white photographs and full-color reproductions are abundant...a good source of information for advanced students." "...provides a solid introduction to the art history of the world...Each era's art and architecture is described thoroughly in the text...This is a useful and reliable resource which will be beneficial to high school and undergraduate students as well as the interested reader." "...provides a solid introduction to the art history of the world...This is a useful and reliable resource which will be beneficial to high school and undergraduate students as well as the interested reader." "The most striking feature is the vivid, full-color photography on nearly every page...an important addition to any high school, academic, or public library..."
"...[a] fine [set]...Each section [of Facts On File Encyclopedia of Art] is handsomely illustrated, predominantly in color...there is a pleasing mix of the well-known image...and the unfamiliar...highly recommended...for libraries serving readers at high-school level and above." "...comprehensive...Written by an august body of authors...Facilitating ease of reading, numerous color and black-and-white images enhance the text...With its...bibliography and quality illustrations, this encyclopedia provides good value for the price...Recommended."